GeoServer does not come built-in with support for Oracle; it must be installed through an extension. Proceed to Installing the Oracle extension for installation details. Oracle Spatial and Locator are the spatial components of Oracle. Locator is provided with all Oracle versions, but has limited spatial functions. Spatial is Oracle’s full-featured spatial offering, but requires a specific license to use. Due to licensing requirements, not all files are included with the extension. To install Oracle support, it is necessary to download additional files. Download the Oracle extension from the GeoServer download page. Make sure to match the version of the extension to the version of the GeoServer instance! Extract the contents of the archive into the WEB-INF/lib directory of the GeoServer installation. The Oracle data store zip file comes with ojdbc4.jar, an old, Oracle 10 compatible JDBC driver that normally works fine with 11g as well. However, minor glitches have been observed with 11g (issues computing layer bounds when session initiation scripts are in use) and the driver has not been tested with 12i. If you encounter functionality or performance issues it is advised to remove this driver and download the latest version from the Oracle web site. 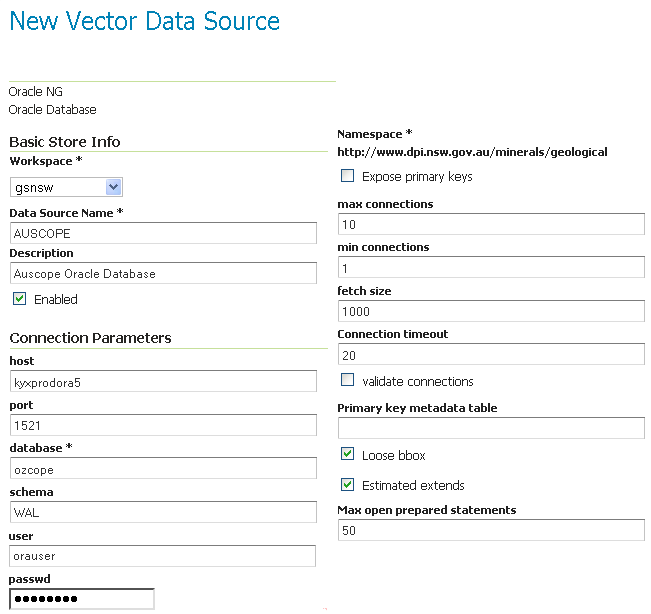 Once the extension is properly installed Oracle appears as an option in the Vector Data Sources list when creating a new data store. host The Oracle server host name or IP address. port The port on which the Oracle server is accepting connections (often this is port 1521). database The name of the database to connect to. By default this is interpreted as a SID name. To connect to a Service, prefix the name with a /. schema The database schema to access tables from. Setting this value greatly increases the speed at which the data store displays its publishable tables and views, so it is advisable to set this. user The name of the user to use when connecting to the database. password The password to use when connecting to the database. Leave blank for no password. max connections min connections fetch size Connection timeout validate connections Connection pool configuration parameters. See Database Connection Pooling for details. Loose bbox Controls how bounding box filters are made against geometries in the database. See the Using loose bounding box section below. More information about this syntax can be found in the Oracle documentation. Recent versions of Oracle support connecting to a database via either a SID name or a Service name. A SID connection descriptor has the form: host:port:database, while a Service connection descriptor has the format host:port/database. GeoServer uses the SID form by default. To connect via a Service, prefix the database name configuration entry with a /. For instance if you want to establish a connection with the jdbc thin driver through LDAP, you can use following connect string for the input field database ldap://[host]:[Port]/[db],cn=OracleContext,dc=[oracle_ldap_context]. When the Loose bbox option is set, only the bounding box of database geometries is used in spatial queries. This results in a significant performance gain. The downside is that some geometries may be reported as intersecting a BBOX when they actually do not. If the primary use of the database is through the Web Map Service (WMS) this flag can be set safely, since querying more geometries does not have any visible effect. However, if using the Web Feature Service (WFS) and making use of BBOX filtering capabilities, this flag should not be set. The Oracle data store by default looks at the MDSYS.USER_SDO* and MDSYS.ALL_SDO* views to determine the geometry type and native SRID of each geometry column. Those views are automatically populated with information about the geometry columns stored in tables that the current user owns (for the MDSYS.USER_SDO* views) or can otherwise access (for the MDSYS.ALL_SDO* views). When the table is present the store first searches it for information about each geometry column to be classified, and falls back on the MDSYS views only if the table does not contain any information. See Setting up a JNDI connection pool with Tomcat for a guide on setting up an Oracle connection using JNDI.